Set between modern day Las Vegas and LA, The Infinite Blacktop sees Claire at her lowest point yet, wounded and disorientated, but just about hanging on. Too smart for her own good, too damaged to play by the rules, too crazy for most - have you got what it takes to follow the self-appointed 'best detective in the world'? There can be a fine line between genius and madness, and Sara Gran's singular detective Claire DeWitt certainly treads that tightrope. 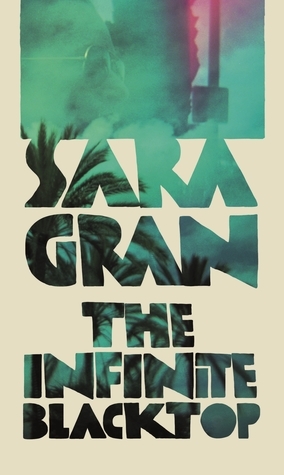 Fans have been waiting for the third instalment in this quirky, hallucinogenic mystery series for a few years now, and Gran certainly delivers with THE INFINITE BLACKTOP. It is a bizarre, addictive story told with flair and a highly original style. Gran's plotting is always delightfully wayward, often leaving more questions than answers, but THE INFINITE BLACKTOP has more structure than the past novels, leaping about in time and place as DeWitt battles mysteries over three time periods in her life. Now (well, 2011, which is the 'now' of the book) she is damaged and drug-addled after surviving a hit and run where her rental Kia lost out to a Nevada-plated Lincoln. Who could have wanted DeWitt dead? It's not a short list, and the self-proclaimed 'best detective in the world' isn't about to let the lowly local police try to find out. So she follows a threadbare lead to Nevada while flashing back to past cases that may or may not be relevant to her current predicament. Growing up in pre-gentrified Brooklyn in the 1980s DeWitt and her childhood pals became infatuated with the comic-book adventures of teen detective Cynthia Silverton, a sort of Nancy Drew heroine, if Nancy Drew had been penned by Lewis Carroll. DeWitt and her friends began solving mysteries themselves, until one of her friends vanished. Years later, DeWitt was reeling from the death of her detective mentor and had few places to turn, so sought the truth behind a famed artist's death in order to gain her private eye licence in California. Could either of these past episodes have any bearing on what was going on for DeWitt 'now'? Or are they both mere sidetracks in the mind of a madwoman? DeWitt trusts very few people, but is she mistaken to trust herself? She's always gone her own way, taking instruction from those shunned by many, adhering to principles others deem foolish, such as those espoused by legendary French detective Jacques Silette in his slim handbook 'Detection', which DeWitt devoured as a youngster. Gran weaves in the mythology of the Silverton comics and the Silette school of detection, raising questions on a meta-level about the nature of truth and investigation and mystery-solving, while also delivering several mysteries herself. THE INFINITE BLACKTOP is probably not for the crime readers out there who want clear-cut cases and strong resolutions, but it's a hell of a good story from a hell of a great writer, who like her heroine, does things her own way, and with remarkable style.